Richard Fariña’s liner notes of Celebrations for a Grey Day. 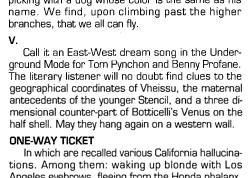 In the liner notes of Celebrations For A Grey Day, Richard Fariña writes: “Call it an East-West dream song in the Underground Mode for Tom Pynchon and Benny Profane. The literary listener will no doubt find clues to the geographical coordinates of Vheissu, the material antecedents of the younger Stencil, and a three dimensional counter-part of Botticelli’s Venus on the half shell. May they hang again on a western wall.” Pynchon was Fariña’s friend, best man, and pallbearer. Gravity’s Rainbow is dedicated to Fariña and Pynchon wrote an endorsement and an introduction to the 1983 issue of his novel Been Down So Long It Looks Like Up to Me. It can be argued that Fariña is also one of the people Tyrone Slothrop is based on. Listen to the song on Youtube. A reference to Esther’s nasal surgery in chapter 4. The song that is up to 15 minutes in length, sometimes made up of two parts, was also released on Live at the Proms 1970 (1988), as a bonus track on the 2007 CD reissue of Third, on a 2014 four-CD set Live in 1970, and on a number of other Soft Machine albums. See Moore 56–57. Listen to the song on Youtube. The English band Benny Profane, active 1985–90, borrowed their name and the title of their 12” vinyl Where is Pig? from Pynchon. Benny Profane is also credited as the writer and producer of the songs (among which “Vain Profane”) and as one of the graphic designers of the cover. Listen to “Vain Profane” on Groovesharks. There was an experimental rock band from the American South, Pynchon fans apparently, that got their name from the bar in V. Band member Dead Joe contributed a text to themodernword.com. For a number of years, British blues guitarist Mike Cooper has cut up parts of V. and Gravity’s Rainbow and turned them into music. Read his statement on his website and watch him perform on Youtube. L.A.-based Tiger Army released an album (their fifth) entitled V ••• – in 2016. 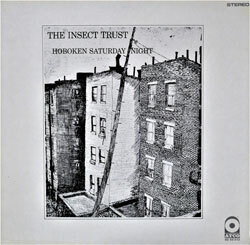 Although the singer Nick 13 cites World War II and paranoia as inspiration in an interview and reviewer Hal Horowitz compares their music to a great number of artists Pynchon mentions too, there is no indication that the album was inspired by the novel. Other albums with the title V where a Pynchon connection could not be verified include those recorded by the metal bands St. Vitus (1990), Spock’s Beard (2000, their fifth), Centvrion (2015, their fifth), and The Flight of Sleipnir (2014), as well as surf rock band Wavves (2015, their fifth). A Laserdisc Best of B.J. Thomas compilation includes a song with the title “The Eyes of a New York Woman,” credited to Thomas Pynchon. The song exists but the credit is likely the product of sloppy work on a not properly licensed collection (or the doings of a Pynchon fan) as this compilation does not appear on the official B. J. Thomas website and the song is usually credited to Mark James or B. J. Thomas. Still, Thomas could be a model for the type of torch song anthology for male vocalists Zoyd Wheeler fantasizes about as he has recorded at least one of the songs Zoyd had in mind, “Since I Fell for You” (Vineland 36). Other oldies mentioned in Vineland Thomas has published on his many compilation albums include “So Lonesome I Could Cry” (6) and a number of pop Christmas tunes.